Can you believe? : Are you adequately ashamed? Recently the New York Times published another article in its "Kremlin Rules" series, covering what its reporters believe is the Putin era's increased authoritarianism. This time Clifford J. Levy correlates this increase with heightened nationalism and an official inclination to downplay or ignore Russia's Communist-era mass repressions. I simply cannot pretend to be an expert on whether a denial of this sad history is truly official policy. But the article, and especially the associated comments from Russian readers, really got me thinking about a related topic--national guilt and who has the right to judge its adequacy. In my growing-up years, my mother was a professor of German language and literature at Roosevelt University in Chicago. I remember overhearing conversations about German "war guilt" and how it was reflected in, for example, the writing of Guenther Grass or other contemporary German writers. I remember hearing debates between my parents (my mother being German and my father being from a country invaded, bombed, and occupied by Germany) about whether Germans felt adequately ashamed of their country's recent Nazi past. Germans themselves, of course, spoke out on every possible viewpoint and nuance of this controversy, and to a lesser extent continue to do so to this day. Every once in a while, the publication of a book, or a major war-related anniversary, leads to another round of reflections, perhaps involving a whole new generation. The patterns of post-totalitarian self-criticism and reflection in Germany and in Russia have certainly been very different. It could hardly be otherwise; the different factors at play are beyond calculation. For one thing, Nazi Germany was completely shut down by an invasion and occupation that included a huge process of de-nazification. Nothing comparable happened in Russia, where the end of totalitarianism was mainly an internal accomplishment (starting, some might argue, with Khrushchev's "secret" speech of 1956). Even comparisons with other Warsaw Pact countries is not really fair; in most cases, Soviet-style totalitarianism lasted a shorter period of time and was partly imposed from outside the country, and probably implicated a far smaller percentage of citizens as complicit in the tyranny. It is important for any country to come to grips with its national demons. The wisdom of Solzhenitsyn's book title, Live Not By Lies, is as valid as ever. And the powerful are probably always tempted to overlook their accountability to the people in favor of personal and class advantages, or, to be somewhat less cynical, simply to get to their goals by what they feel are more efficient methods--especially when chaos threatens. Transparency and due process are worth the agonies it takes to build them into any country's politics. And humane democrats of all countries should encourage each other in these efforts. But what does genuine encouragement consist of? In the Russian case, I don't know if it will "take forty years to unlearn the habits of slavery" as the poet Bulat Okudzhava once said on a television interview, what that process will consist of, and how non-Russians can help. I don't think it's helpful for Americans and others to be morbidly fascinated by Soviet-era pathologies, constantly trying to assess whether Russia has adequately atoned for those events. Many of the Russian commenters on the NYT article seem to agree. In the face of the clear negative thesis of Levy's article (and, granted, it's a very diverse set of responses), as a group they seem to be saying that (1) we truly do know what happened in the years of repression; that knowledge is out in the public arena and can never again be hidden, and we don't rely on foreign sources for this information; (2) those presently in power tend to emphasize pride, not shame, and while we don't want to live in denial, we understand this pragmatic choice in view of today's national priorities; (3) the social tissues of complicity and victimhood are so complex and pervasive that 100% transparency, however desirable theoretically, might not be achievable; and (4) when it comes to transparency and atonement for national sins, America has unfinished business as well. 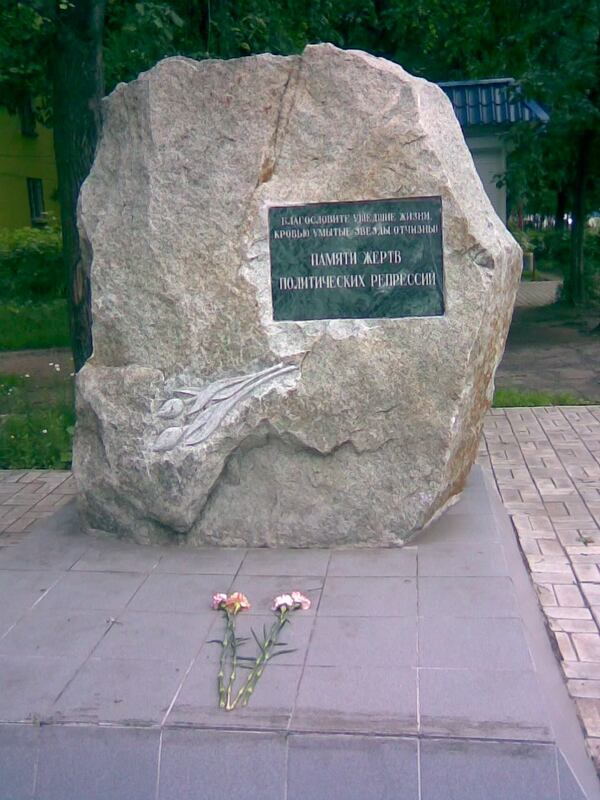 By the way, emphasizing pride rather than shame is not a peculiarly Russian phenomenon. I remember how Michelle Obama's words about finally being proud of her country provoked a major storm of criticism, as if America's long long record of systematic, pervasive racial discrimination should have absolutely no effect on how one feels about one's country. Every country probably has its share of mindless pseudo-patriots, who display no capacity for reflection and regret. In the long run, no country is well served by ignorance, but politicians observably find it expedient to make appeals to this constituency--yes, even in the USA, where our recent political season featured flattering references to the "real America" where doubters are scorned and where people know better than to share the wealth. Those who do have a calling to be more reflective and prophetic about national traumas will probably always face an uphill battle. There's nothing wrong with Americans who love Russia to support transparency and healing, but only if it doesn't strengthen the impression that all we want to do is ignorantly pour salt into old Russian wounds for the sake of American political agendas or simply to reinforce our own prejudices. And don't forget that Russians have a legendary capacity for self-criticism, even as they share the universal dislike of being spit on by others. Screen shot of debate show "To the Barriers"
Some of the Russian commenters in the New York Times agree that there's official discouragement of attention to past repression. Part of the evidence cited is the lack of visibility and enthusiasm concerning monuments and archives. Elektrostal, on the other hand, does have a recently-installed monument to victims of repression, which always seems to have fresh flowers on it. And here's something else I find interesting, in view of the NYT article: earlier this week, cable TV came to our apartment. The very first evening I turned on our television, I saw part one of a very moving two-part documentary on the dissident writer Andrei Sinyavsky. 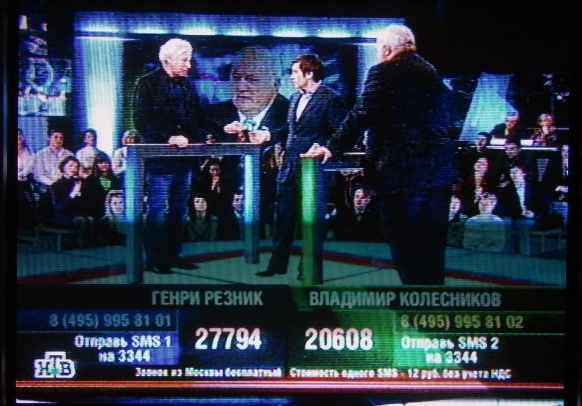 And just this evening I watched a political debate show on the NTV network, featuring a lively confrontation on the jury system and legal reform. (Interestingly, one of the participants had been a lawyer for Andrei Sinyavsky.) Debaters touched on Soviet-era repression and on present-day political pressures to weaken due process. Nearly 60,000 people made the effort to call in and vote for one or the other of the debaters. One monument here, one or two TV shows there, don't necessarily prove a trend, but fair journalism would include such evidences of a mature and persistent democratic spirit as well as of the more discouraging developments. Righteous links: In just two days: The International Women's Club of Moscow's annual Winter Bazaar. ~~ While we're looking at calendars, mark February 5, when Friends will gather at the Arch Street Meetinghouse in Philadelphia to celebrate the long-anticipated release of Fit for Freedom, Not for Friendship: Quakers, African Americans, and the Myth of Racial Justice. ~~ Who told me about Duckworks? I can't remember, but thank you! [FRIDAY PS: It was Mary Kay Rehard.] ~~ See the recent entries from Israel and Palestine on Joel Bock's blog. ~~ Politics getting you down? Indulge in some lunar nostalgia from Astronomy Picture of the Day. Picture one; picture two. 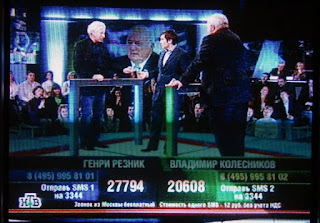 ~~ For Russian readers: the Web site of the debate show I mentioned above.